Music is often mentioned as one of the motifs in The Picture of Dorian Gray. Of the novel’s twenty chapters, only four don’t have musical references in them. But, despite this abundance of musical terms or names of composers and performers, only four musical works are explicitly mentioned. In this short paper I will try to connect these pieces to the novel’s plot and atmosphere, assuming that when Wilde mentions a musical piece, he is probably familiar with it, and, maybe, it even echoes in his mind at the time of his work. These works were, in my opinion, chosen very carefully by Wilde not only to add ambiance to the novel (which they do), but they also hint, predict and relate strongly to Dorian’s character and to the plot itself. I will try and limit myself to presenting in a very short manner only the direct context and connections between the musical works and the novel’s plot, and avoid going into musical or artistic analysis of them. This I leave to the music and arts experts. Forest Scenes, a cycle of nine piano miniatures, presents us with a forest (a specially loved German romanticism subject) where each miniature is entitled according to its place in this forest setting. The first piece, Eintritt (Entry into the Forest), takes us into our walk the forest with a peaceful walking rhythm, in a similar matter as the reader is taken into the plot of the novel, or, as I will try to show, Dorian himself is presented with a glimpse of his future life and choices. Robert Schumann, Waldszenen (Forest Scenes), Op. 82. Bartholf Senff: Leipzig, 1850 First Edition. Lithographed cover showing a hunter seated with his dog and catch in a clearing of a dense forest. The names of the pieces are written across individual leaves of foliage in the foreground, and a banner across the top bears the incipit of the Jagdlied. The second piece, Jäger auf der Lauer (Hunter on the Lookout), is a highly animated one, which is brought to an abrupt close with a sound resembling two rifle shots, which might foreshadow the killing of James Vane further on in the novel.One other troubling piece in the cycle is no. 7: Vogel als Prophet (The Bird as a Prophet). The poetic motto for this piece (although discarded later by Schumann) is taken from the last line of Joseph von Eichendorff’s poem Zwielicht (Twilight): Hüte dich! Sei wach und munter! (Take care! Be alert and on thy guard!) Eric Jensen went further and interpreted the prophecies of the bird as ‘foreboding of warning and imminent danger’. Christopher Reynolds discusses another allusion in Vogel als Prophet to Schumann’s Scenen aus Goethes Faust. Schumann used the same musical motive in the boys’ chorus in part III of the work where the chorus warns the innocents.Is Wilde warning Dorian of an imminent danger when he meets Lord Henry for the first time? Are the different places in the forest can be seen as symbols of the choices before Dorian at this early stage of his life? Or does the cursed place with the flower nourished by blood remind us of the picture and Dorian’s soul? I would like to think that the answer to the above questions are affirmative. I wouldn’t presume that Wilde was or was not aware of the recurring musical motive in Scenen aus Goethes Faust, but if he was, than here we have another link to the novel resemblance to Goethe’s ‘Dr. Faust’ (being introduced in so many articles by so many critics). That ‘Art is long and life is short’ is a truth which every one feels, or ought to feel; yet surely those who were in London last May, and had in one week the opportunities of hearing Rubenstein play the Sonata Impassionata, of seeing Wagner conduct the Spinning-Wheel Chorus from the Flying Dutchman, and of studying art at the Grosvenor Gallery, have very little to complain of as regards human existence and art-pleasures. ‘That was at Lohengrin, Lady Henry, I think? But Lohengrin, besides providing suitable background music to the chapter, provides also some similarities between both the opera and the novel’s plots. 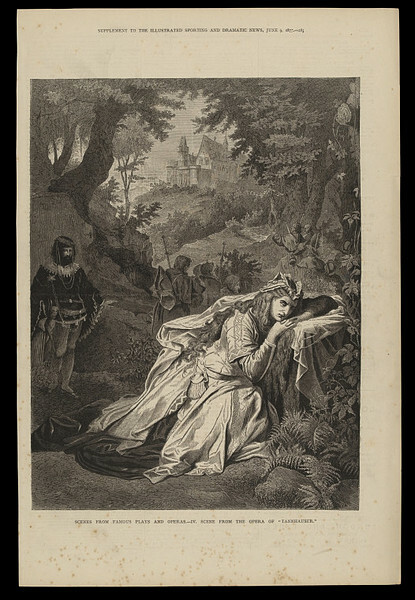 Lohengrin arrives to the rescue of Elsa as her knight in shining armour similar to Dorian (‘Prince charming’) intent to rescue Sibyl from Isaacs and his shabby theatre. Lohengrin abandons Elsa just before their wedding and so does Dorian, leaving Sibyl behind. Sibyl doesn’t know Dorian’s name, similar to Elsa, who does not know her saviour‘s name. When abandoned, both Elsa and Sibyl are stricken with grief and die. And finally, Elsa’s brother reappears after many years as Jim reappears after 18 years towards the end of the novel. The second of Wagner’s operas mentioned in the novel is Tannhäuser. In chapter eleven, where the picture is already revealed to the reader as Dorian’s dark soul, the narrator tell us how Dorian has become obsessively drawn to Wagner’s Tannhäuser and the ‘rapt pleasure’ Dorian takes in ‘seeing in the prelude to that great work of art a presentation of the tragedy of his own soul’. Here we don’t need to speculate since Wilde points out the connection and context of this musical work to the plot. But Tannhäuser has more connections to the novel than the ones revealed in Dorian’s thoughts. This musical work is regarded as one of the main symbols of the decadent movement. For Tannhäuser, as for Dorian, the highest love lies only in the pleasure of the senses. As Sibyl sacrificed her life for her unfulfilled love for Dorian so does Elizabeth in the opera, and as Tannhäuser will seek redemption so will Dorian on the evening of his death (though Dorian did not fully repent his sins). A curious resemblance can be found between Tannhäuser and Wilde’s life in Wilde’s conversion to Catholicism at the end of his days, but that’s beside the point.I limit myself to the above, though ‘Tannhäuser’ is mentioned by Wilde in The Critic as Artist (which was first published the same year as The Picture of Dorian Gray in Lippincott’s Magazine). In addition, some critics have found parallels between Tannhäuser’s motives and other Wilde works (for instance The Fisherman and his Soul). …charming. Painted with Chopin’s most ethereal brush…, the double sixths, fourths and thirds are magically euphonious. The second subject, I agree with Karasowski, is the most beautiful melody Chopin ever wrote. It is in true barcarolle vein; and most subtle are the shifting harmonic hues. I believe that a good author, before setting off to write a novel, conducts a thorough research on the topics or terms he decides to incorporate in his work. Wilde was probably no exception. Having that said, I based the above text on the assumption that Wilde was familiar with the musical works he mentions in the novel to a great deal of extension.Last, I would recommend that if the reader of the novel would like it to ‘sound different’ next time, he can read chapter two along with playing Schumann’s ‘Forest Scenes’ in the background and chapter four accompanied by Wagner’s ‘Bridal Chorus’ from ‘Lohengrin’. For Chapter eleven ‘Tannhäuser’s’ Prelude can add color and chapter nineteen will have a different ambiance with Nocturne Op. 37 no. 2, Chopin’s beautiful melody. Christopher A. Reynolds, Motives for Allusion: Context and Content in Nineteenth-century Music. Cambridge, Mass. : Harvard University Press 2003. Oscar Wilde, ‘The Grosvenor Gallery’ Dublin University Magazine 1877. As Dorian tells Lord Henry: ‘Then we must get her out of the Jew’s hands’ (p.81). Yair Dagan writes ‘As for myself, regarding art and literature I have no formal education (except in musicology), but extensive knowledge from years and years of being an enthusiast. I come from the computer industry, and have my degrees in computer science and mathematics. I also own a master’s degree in Law. My knowledge on Wilde and the late Victorian era is from self-learning, but I really got deep into it.